Daleys Fruit Tree has Plants for Sale to Knockrow and can Mail Order them to you door. Click to Find out how much Freight Will Cost. 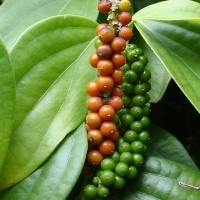 Cultivated for the fruit which is dried and used as a spice and seasoning. The fruits are dark red when fully ripe. Immature fruits can be picked as green pepper, black pepper is the fruit dried with the skin on and white pepper is the dried seed only. Black pepper is the worlds most widely traded spice.